Understanding your site drainage system is a key component of pollution prevention. A well planned and well maintained system can prevent pollutants such as oils and chemicals entering watercourses or groundwater systems. Allowing spills to enter the drainage network and pollute controlled waters or groundwater can cause major environmental problems and clean up can be extremely expensive. Controlled Waters: Spills which enter the surface water drainage system may discharge directly into controlled waters e.g. rivers, lakes etc. or into controlled waters via a public surface water drainage system. Groundwater: Spills which enter the surface water drainage system may discharge into the ground and subsequently the groundwater via soakaways or through damaged drainage. Sewage Treatment Works: Spills into foul or combined drainage will discharge into the local sewage treatment works, if the spill impacts the bacteria used in the process the polluter will be liable for the costs to reinstate the bacteria essential to the process. 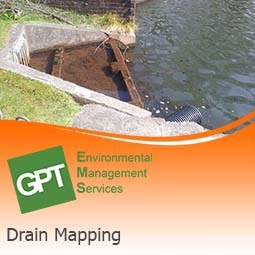 It is therefore essential to ensure that you have a good understanding of your drainage system so that if a spill does enter the drainage you can identify where it will discharge and notify the required bodies (surface water/groundwater spills EA, SEPA, NRW, NIEA and foul/combined spills the local sewerage undertaker). A good drain plan will detail drain runs, pollutant sources/activities, control measures and points of discharge. Our drain mapping survey will identify surface water, foul drainage, effluent routes, interceptors/separators and any other control measures e.g. drain closure devices and can be undertaken by removing the inspection covers and visually examining the drainage pathways contained within each specific chamber. Collating and studying all existing drainage plans in order to build a general picture of the sites' drainage system. Establishing connectivity of all site drainage (through visual inspection and dye testing). Measuring invert levels and pipe diameters. Investigating outfalls/off-site discharge of storm and foul systems. Identifying any environmental control measures e.g. interceptors. 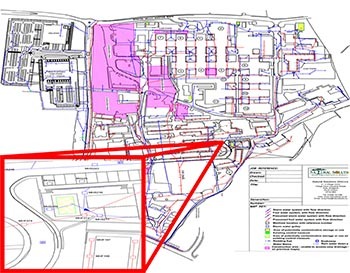 Data is presented on a colour coded CAD (Computer Aided Design) site plan, with an index of all drains and drainage features. We also provide general survey recommendations including suggestions for remedial action needed. Further works can include painting drain lids in accordance with their usage (red for foul, blue for storm), enabling easy identification in the event of a spill. 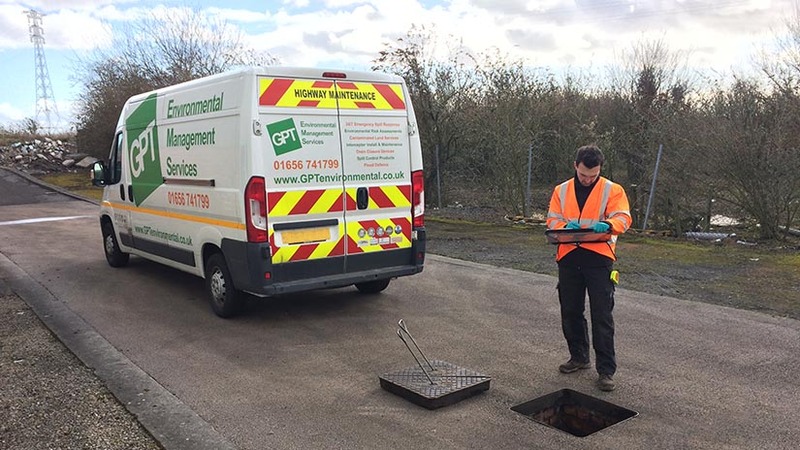 We operate a little differently to drainage companies, priding ourselves on having CAD technicians to complete the drainage drawing and having an Environmental Consultant in attendance to manage the survey looking at it from an environmental compliance point of view. We want to make drain plans as easy to interpret as possible, enabling speedy response in the event of an environmental incident. Further to the environmental benefits there may also substantial financial benefits to ensuring your drain plan is up to date. The water boards in the UK will calculate your sewerage charges based on what you are sending to the sewage treatment works. These charges are based on estimates and if you can show some or all of your storm drainage is discharging to a watercourse e.g. a river, stream or soakaway then you may be able to prove you are being overcharged. All sewerage undertakers (water boards) in England and Wales have a surface water rebate system where you can claim back over payment of previous sewerage bills and/or reduce any bills in the future. Surface water rebates apply to both businesses and home owners. All water boards’ application processes vary slightly, however you will need an accurate drainage plan to qualify for any rebate. Click on the case study for more information regarding how our drain surveys can help you with the rebate process. where they discharge into, e.g. a watercourse, a clean water soakaway, sewage treatment works"
red ‘C’ for a combined system where all water goes to a treatment plant"
GPT head office is based in South Wales and covers all areas of South Wales, West Wales and Mid Wales including Cardiff, Swansea, Bridgend, Newport, Port Talbot, Powys, Llanelli, Neath, Pembrokeshire and Aberystwyth. We also cover the South West of England including Bristol, Plymouth, Bath, Gloucester, Somerset, Cornwall, Devon, Worcester, Southampton and Swindon. We also operate across the midlands, London, Birmingham, Leicester, Northampton, Derby, Stoke, Nottingham, Coventry, Liverpool, Manchester, Sheffield, Slough, Heathrow, Leatherhead and Surrey.